Sculptures – Khmer Civilization. The stone carving skill of the ancient Khmer was basically inherited from the Indian civilization, however, it was later evolved into its own unique Khmer style. 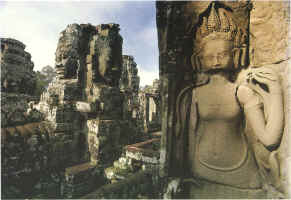 The Khmer sculptures were carved from stone with great craftsmanship and many of them represent the Hindu deities such as Shiva, Vishnu, Brahmans, the elephant god Ganesha and many other gods and goddesses, as well as Hindu mythical monsters such as the serpent naga, the demon kala, the giant makara, and the mythical lions. Some large sculptures even portray the epics of the Hindu myths such as Mahabharata and Ramayana.